Dark smoke rises above Aden Abdule International Airport in Somalia's capital Mogadishu, Aug. 9, 2013. An Ethiopian military plane crash-landed at the airport in Somalia’s capital on Friday, killing four people. The cause of the accident is being investigated. 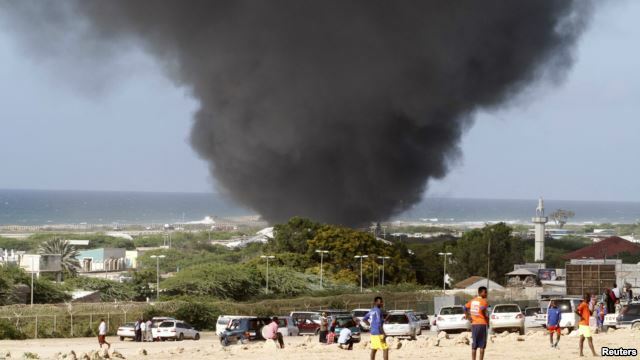 The African Union peacekeeping mission in Somalia, AMISOM, said an Ethiopian Air Force plane burst into flames upon landing at Aden Abdulle International Airport in Mogadishu. A statement from the peacekeeping force said four crew members were killed and another two were taken to an AMISOM hospital to be treated for injuries. Somali government spokesman Ridwaan Haji Abdiwali said that so far, there were no signs of foul play. “The Somali government confirms the plane crash took place,” he said, “with a loss of lives and property. Investigations will be carried out into what actually happened. The crash is nothing other than a normal accident,” he said. Ethiopian forces have been engaged in the fight against al-Shabab militants in Somalia since 2011, although they are not a part of the AMISOM mission. Ethiopian troops were instrumental in securing the south-central town of Baidoa, and other territory previously under militant control. Witnesses at the airport reported hearing explosions following the crash, indicating the plane may have been carrying ammunition. An al-Shabab Twitter message called the accident a “victory from Allah” but did not claim responsibility for the crash. The Somali prime minister’s office said the government was appointing a committee to investigate the cause and to assess the damage.